Tomorrow, we enter into Holy Week, the week which culminates in the Sacred Paschal Triduum - the solemn commemoration of the Passion, Death, and Resurrection of Our Lord Jesus Christ. 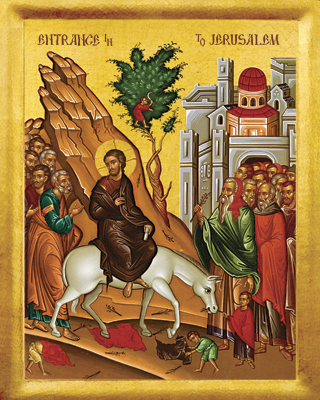 Holy Week begins with Palm Sunday, a day on which we commemorate two events: the triumphal entry of Christ into Jerusalem (commemorated during the procession and the beginning of Mass) and the Passion of Our Lord (commemorated beginning with the readings and continuing until the end of Mass). to you reigning on high. lover of all that is good. blest in the Name of the Lord. and all creation join in. we come to pay you our vows. As the Lord entered the holy city, the children of the Hebrews proclaimed the resurrection of life. Waving their branches of palm, they cried: Hosanna in the highest.